My nanny was a prolific knitter and you only had to mention on the phone that you needed something and it would arrive in the post a few days later. She taught me to knit when I was about seven or eight but over time I haven't progressed all that much. My Mum knits now and then and my mother-in-law is also a fantastic knitter (as seen here). She is responsible for all the beautiful jumpers and cardigans my boys wear. Unfortunately she lives too far away for the times when I inevitably get stuck with a pattern, so this morning I went to my first ever Knit and Natter. It is held every Wednesday morning in my local wool shop (I can't quite bring myself to say yarn store, does that make me a typical Brit stick-in-the-mud?). I have made a couple of baby jumpers and cardigans in the past, but never very elegantly. I am currently working on a cardi for a friend's baby and wanted it to be a little more refined, so knew I needed some expert help. I am fine with the casting on and off, even some of the complicated patterns. My trouble is that I knit quite tightly, so when I come to the part of the pattern that says 'pick up and knit' I get a bit anxious because I can't do it very well. The current cardi I'm doing requires me to pick up and knit up the right front, along the back and down the left front all on a circular needle. A lovely lady called Sue from the group kindly showed me how to do it neatly, whilst bamboozling me with all sorts of instructions to ignore the pattern, change the ends and alter the rib. All very well meant but a little overwhelming. Sue showed me how to pick up and knit, but she only used one needle and I couldn't grasp the technique myself. Eventually she offered to do it for me, which I readily agreed to as now I have a perfect join. I managed to knit the next three rib rows without trouble, but now I have come to the buttonhole rows. As Sue deviated from the pattern and I'm not confident enough to freestyle buttonholes I think I might just get on with something else and take it back next week. That being decided, I thought I would get some new wool to make a girls cardigan with, should said friends little one not be a boy. Some Aran weight also fell into my basket - I want to make a knitted mug cosy from Mollie Makes. The pattern uses moss stitch (knit one, purl one), which I have never attempted before and wouldn't want to do on a large scale but I think a mug cosy is about right for my talents. For those of you visiting for sewing related chat, I do hope to be making a return to it next week, it is just that for now, knitting is suiting my temperament and circumstances. I find that if I try and sew when I don't feel like it, everything goes wrong, so sometimes it is better to wait. Just as well I'm not dependent on my livelihood for it! Does anyone else feel like that? I'm with you there! I've been making clothes for over thirty years, and even now, if I'm having an off-day you can bet your life that something which ought to be so simple I could do it in my sleep, will go frustratingly wrong! Knitting, on the other hand, means I can just sit down, put on a DVD, and chill out for an hour or so. Do you know Ravelry.com? There is a wealth of information and help on there - might be worth checking out, if only to use as a safety net in between K&Ns! There's a lovely group called British Knitters on there - they are very welcoming. I have only just discovered Ravelry but as yet haven't spent much time there but I will have a look for British Knitters! Word of warning...the mug cozies are very addictive! Just to let you know I have awarded you the Vesatile Blogger award. 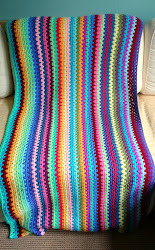 Please check out my blog for details www.Ooohbetty.blogspot.com. I would love a knit and natter group to go to. It must be lovely to have someone on hand to help out. I've come around to the yarn shop thing as I've accepted not all yarn is, in fact, wool, but I totally know what you mean, it just doesn't seem right. You seem to be doing really well with the knitting. I love the effect that moss stitch gives, but have to admit I don't like knitting it very much as it's a bit slow going. Mug warmers should be OK though as not too big. My daughter under rates herself (mother of missmagpie). She is very accomplished in all the things she does. I love doing all the crafty things but as an Aquarian they all tended to be thrown together but somehow they worked. Nearly all my makes were one-offs invented as I went along. I made a marvellous all in one knitted red woolly oversuit that my youngest insisted on calling her "tomato soup". This was made from reclaimed wool from someone elses project.